Mat or raft foundation is one type of combined footing which envelops entire area under a structure providing supports for all columns and walls. This foundation is usually supported on rock or soil; but piles are also used to support foundation element. 1. When the allowable bearing pressure of soil is so small and building structures exerts too heavy loads to be accommodated by area of individual footing within the floor area of structure, raft foundation is suggested. 2. When soil is very erratic or have compressible lenses and not easy to asses or define extent and location of cavities or other weak pockets and subsequent uncertainty in computing total and as well differential settlement. 3. When equipments, in case of industrial or other commercial floors and structures to be placed on soil have very sensitivity to unequal settlement. 5. 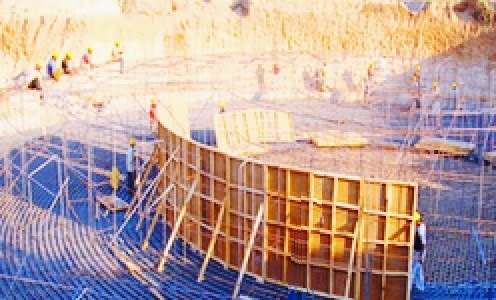 To achieve floating foundation where soil has very low bearing capacity; the purpose is to balance weight of super-structure by soil mass removed to place foundation. 6. In some conditions like pits to be supported on foundations such that ground water table is above them or where basements are required according to architectural requirements. 7. Structures where isolated foundation may be subjected to bending moment of varying magnitude which may cause differential settlement and differential rotation of isolated footing and subsequent distress in structure above; raft foundation is suggested.